PezCycling News - What's Cool In Road Cycling : Toolbox: Inside Or Out? Winter is a drag! Cold and wet, dark and generally no fun. Winter is glorious! Crisp mornings, bright sunshine warming through the cold, and hot coffee! Given this dichotomy what is an athlete to do? 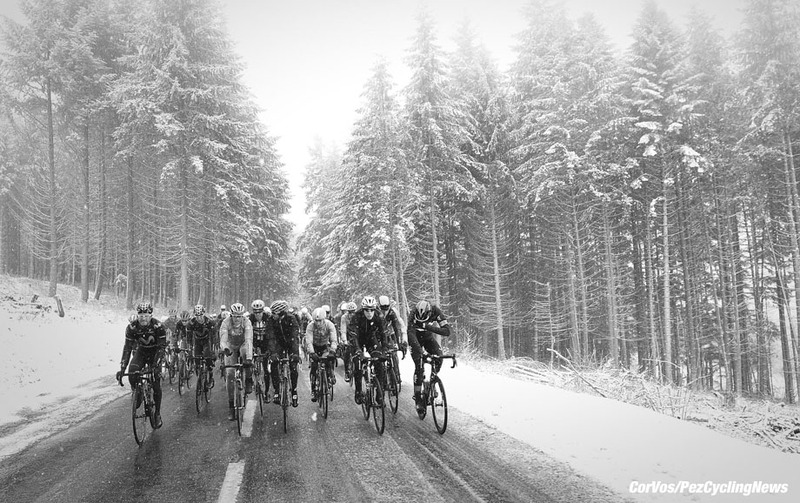 Mixing and matching your training in winter weather is essential and can be hugely beneficial. Doubtless we would all choose outdoors for a ride if given the option. It is part and parcel of who we are, but just as certain is the fact that Mother Nature will surely interrupt this habit more than a few times in a typical winter. On days such as these you still have choices. Forgo training and call it a “recovery” day, head to the gym for some “cross training” or you can pile on the indoor trainer and slog away in monotonous misery and pools of sweat. Then again, you can summon your bravado and head out into the maelstrom as well. Truth be told, there is almost no weather that is truly too horrific to train outdoors, if you have the courage, the gear, and the right attitude. Indeed, winter training actually provides you with a myriad of options, both indoors and out, that serve to have you more prepared than ever for those warm days to come! I’ll be the first to admit – I hate riding indoors! I hate it at a level so deep that I haven’t put my leg over an indoor trainer more than a few times in the last 8 years, and those were mostly for testing or product evaluations! Somewhere around the time my daughter was born, my will to suffer inside left and has shown no signs of returning. Then again, I take a certain pride in being a “hard” rider. I love ridiculously steep climbs, dirt roads, getting (mostly) lost, mixed terrain and mud. I want to be like Sven Tuft or Eric Wohlberg – classic hardmen who ride better the worse the conditions. The guys who relish Roubaix, thrive on the pave, and crush the Belgian spring…those are the guys I want to emulate, so I guess it’s time for an attitude adjustment. Of course indoor training today is not the indoor training of yesteryear. To get past the monotony we are lucky to have a myriad of options, from Sufferfest videos, to ErgVideo and online apps like Trainer Road and Zwift. If there were a better time to train indoors, I can’t imagine what that might look like. So, given the current state of indoor training and the wettest winter I can remember in Northern California I made a personal commitment to re-engage with my trainer. I did it to get “tougher” and to embrace my fear, but I also did it because indoor training is hyper efficient. Sixty to ninety minutes of indoor work is easily the equivalent of 25% more outdoors since you can’t stop pedaling. The caveat is that you will likely be 5% (or more) less powerful indoors than out due to the higher core temperature, lack of convection via airflow (get that fan out!) and loss of fluid movement on the bike while it is attached to the trainer. I would advise that those early rides be largely free form so you can learn the nuances of force and effort without trying to knock off a twenty minute effort at your threshold power. You will adapt to the rigors of indoor pretty quickly and may even learn to embrace the efforts as you find fitness rising and tenacity along with it. Add in the new social nature of indoor riding and it is something I almost (almost) look forward to! As a coach I can see a host of ways to work with my athletes and teams to improve their efforts. From designing custom workouts and intervals, to repeating key workouts ahead of a race in near laboratory settings. On the team front we can do practice lead-outs, pace climbs together, and even race against other teams if everyone gets organized! Not quite the same as real world yet, but there is some really amazing stuff on offer in the online realm. I look forward to exploring it more over the next weeks and months. For all the benefits and efficiency of indoors, it is embracing the rigors of the wintry outdoors that is the true path to warrior status. Stepping through the doorway into the rain or snow takes a certain devotion out of the box. It is often hardest in those first minutes from resolving to put on all the layers, shoe covers, and fenders to actually stepping onto the bike, and surviving the five minutes of discomfort that always comes. But as with pain, the discomfort passes as you settle into the habit and rhythm of riding. The fact that it is freezing or raining or icy may force you to further steel your resolve once out, but merely getting out the door is the most important step. Of course there are caveats to this as well. The first is be prepared! Investing in the right clothes and equipment makes most anything tolerable. If mountaineers can survive minus 30 degrees on Mt Everest in the midst of driving winds, you can survive that 30 minute climb on slushy roads. If you haven’t found that resolve yet, I implore you to give it a try… get out and see what your mind and body can tolerate. You will likely finish the ride proud of your effort and just that little bit tougher than you started and a bit more prepared for the suffering to come in the season. On the practical side, ride lower tire pressure and a good all-season set of tires (Continental Gatorskins are my go to choice) and save yourself some unnecessary falls or dreaded flat repairs in cold weather. Winter is a great place to work on your skills. It’s like cyclocross without the mud! Well, without as much mud. Braking, leaning the bike and cornering will all be much improved after a winter of outdoor riding, making you all the more safe when surrounded by indoor types on the start line. Winter used to be the excuse for falling fitness and rising weight, but no longer. The advent of truly viable and entertaining indoor solutions helps maximize return on training time, while improvements in clothing and technical gear makes riding outdoors viable in nearly every condition. While the physiological benefits of both are easy to quantify, I think the mental benefits of enduring hardship are as great or greater. Embrace indoor and outdoor training, no matter the weather, and you will enter the season with more fitness, more fortitude, and that “hardman/woman” attitude we all covet.